creates a default border layout with no space between components. creates a border layout with spaces between components. 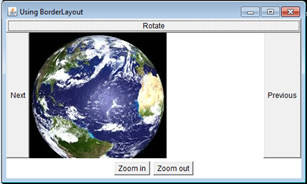 In the example code below, the Rotate button is placed at the north part, the Next button at the west part, the Previous button at the east part, the Zoom in and Zoom out buttons at the south part of the Frame window. The image that is displayed on the Label component is shown at the center part of the Frame window.